With the phenomenal help and generosity from all sectors of the public we were able to give financial support to 103 families in 2018. This brings the total number of families supported to 586, and as you will see from this map these families are located across the country. 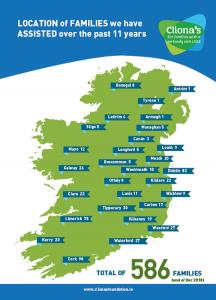 But there are 4,000 children with a life limiting condition in Ireland and it is estimated that it costs an additional €10,000 per annum to care for a child with a life limiting illness. We are doing what we can with the limited resources we have to relieve some of the financial burden but would love to be in a position to do more. 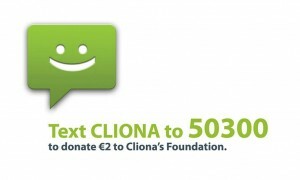 But we are very proud of this picture and the difference we know Cliona’s Foundation has made over the past 11 years.